More than 72 per cent of the dialysis patients do not undergo the prescribed treatment, according to a study on patients’ behaviour. “While 3 sessions per week is the globally accepted minimum treatment modality for kidney failure, around 72 per cent patients in India opt for lesser frequency which adversely affecting their longevity and quality of life,” the study by NephroPlus, a dialysis provider network, stated. As per the findings, patient behaviour to “under-treat” themselves is an outcome of their lack of affordability and also understanding of the implications which puts them at risk of cardiac arrest. The study involved over 1,300 patients across 10 states Andhra Pradesh, Karnataka, Maharashtra, Kerala, Tamil Nadu, Delhi, Telangana, Jharkhand, Uttarakhand and Uttar Pradesh and was done between January 2013 and July 2014. “With more than 2 lakh people developing kidney failure every year, it is one of the most chronic epidemics to affect the country, but it is widely neglected. 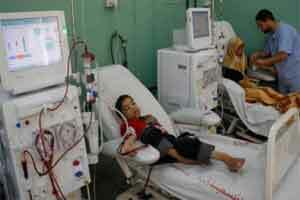 “While there has been some improvement with some state governments’ subsidising the dialysis treatment, the situation calls for greater participation from state and central governments,” said Kamal Shah, cofounder and director of Patient Services, NephroPlus, who himself has been on dialysis for more than 18 years. “Adoption of innovative models such as public private partnership can definitely make dialysis accessible and affordable,” said Dr Umesh Khanna, Chairman of Mumbai Kidney Foundation. The experts also called for strict implementation of infection-prevention protocols combined with clinical audits to contain the spread of cross infections. As per the report, around 16 per cent of the dialysis patients across the country were affected by Hepatitis C which called for better quality treatment facilities across the country. Hepatitis C is one of the most dangerous cross infections that dialysis patients get infected. Majority of people with Hepatitis C will proceed to liver cirrhosis necessitating a liver transplant further deteriorating the health and causing early mortality among dialysis patients.